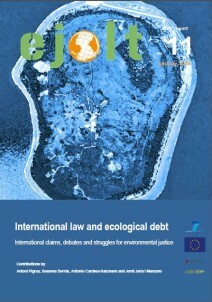 Under the paradigm of sustainable development, contemporary international law has not been able to shape an effective, nor an equitable, answer to the global ecological crisis. There is widespread consensus that environmental governance requires a major overhaul if humankind wishes to meet that challenge. Our main point is that global patterns of ecologically unequal exchange will not be corrected just by minor adaptations of existing international regimes. Nor will change come through the formal enactment of a given set of principles. Rather, correction will require a profound reconceptualisation of global governance that is able to integrate counter-hegemonic claims for environmental justice. This report has four parts. The first one is a conceptual introduction that puts in context concepts emerging from the academic or social movements, such as ecological and climate debt, against the backdrop of the legal narratives that underpin the hegemonic model of development. The second part presents a critique of the notion of sustainable development as a supposed paradigm for reconciling the needs of present and future generations with the preservation of the Earth’s ecosystems. The third part emphasises the potential of current international law to deal with the needs of intragenerational and intergenerational justice in relation to sustainability. In this section, which echoes a growing academic debate, we argue that a reinterpretation and reconstruction of the current international order in terms of global constitutionalism and an enhanced human rights approach, offers a way to mitigate the present biases in international law. Finally, the fourth part is much more speculative in nature, outlining some ideas that may be found beyond the elements already present in current international law.